The trouble with most Finance and ERP systems is that they're not truly integrated with other parts of the business. You'd be surprised at the number of products out there that are just bolt-on bits and pieces or are separate systems with rudimentary integration. They don't properly integrate and some don't even do the simple book-keeping properly. With Greentree your entire team will have access to all the operational intelligence that they require to drive your business efficiently and cost effectively. By automating many of the everyday tasks within your organisation you free up more people for the development of new ideas and improve your decision making. The core of every successful business. Greentree's ERP Software provides a suite of financial management tools for your company. Imagine having a complete, highly searchable library of all the reports and documents assigned to you. That’s what Reports and Documents brings to your screen; you always have the most recent version available to you, are alerted to any changes made or actions assigned to you. A full, auditable, history is recorded against each document with the power to discuss changes across the group of users’ assigned access to it. From inbox to approval in just 18 seconds; eDocs slashes the time and cost of getting invoices, customer remittances, supplier statements etc. through your system. It's elementary. You don't have to be a detective to figure out what's going on with a job. 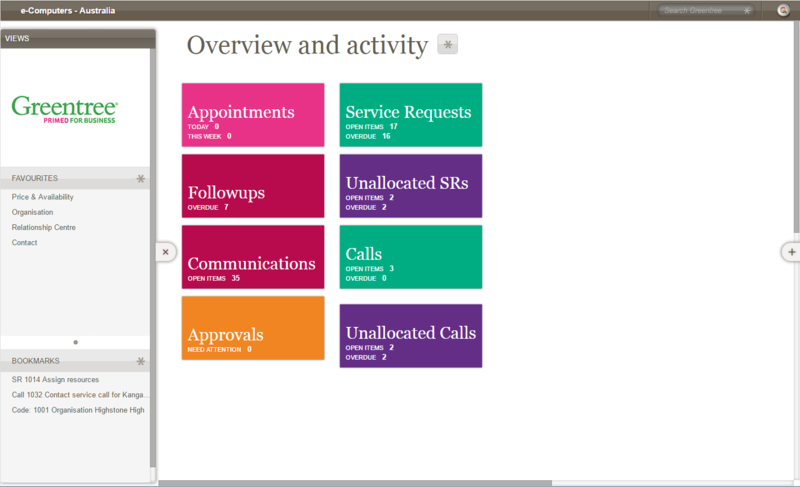 If you want to know the who, what, when, how and why, you can see it at a glance from the Job Management Screen. The profitability of your projects rests on how quickly and accurately you allocate time, resources, materials, purchases and revenues to jobs and projects. With Greentree’s Job Cost Management suite you can give your business the agility it needs to respond to customer needs more effectively and profitably than your competitors and deliver the visibility and financial insight you need. Greentree4Sales connects your sales engine to your business engine in the most powerful way possible. Using the latest browser-based technology for a powerful sales performance from your desk, on the road or where ever you may be. Effective management of your organization's personnel begins with maintaining accurate and detailed records. 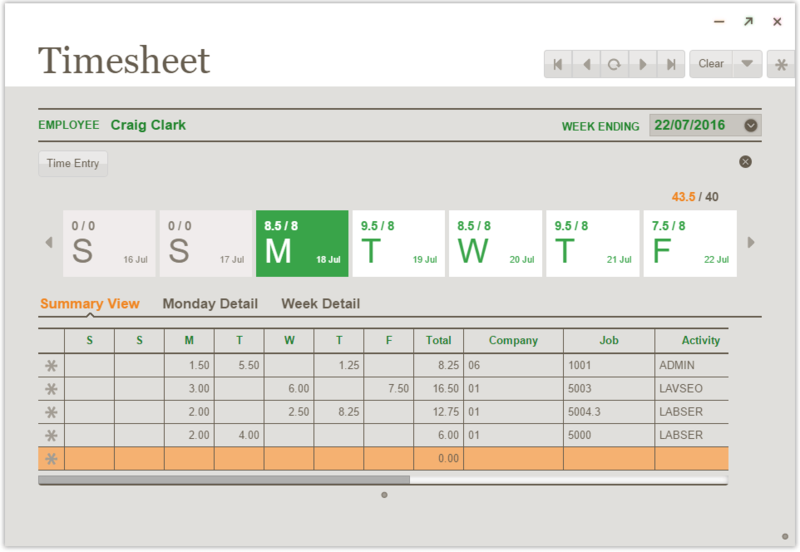 Greentree's HR and payroll modules are pretty well unique: they are totally integrated with the rest of the Greentree system. People form the true value of most businesses and the effective and comprehensive management of their competencies, knowledge and personal attributes can be complex and incur costly overheads. Greentree's HR suite offers the complete set of tools to manage personnel throughout your business. Enter a new employee in the HR module and they are ready for allocation in project costing and can enter time sheets and payroll is fully integrated with HR. No need to update employee details in two place. Greentree payroll has been tested by HMRC and is recognized by them. Greentree's full integration and high visibility inventory management system along with effective warehouse management and mobility will future proof your business while giving you online access to information, effective credit control and management of back orders. Meeting the requirements for tracking and management of inventories and standing orders along with materials requirements planning and information regarding bottom line impact. In addition Greentree also enables your business to eliminate data handling errors improving productivity, customer relationships and total visibility fraud prevention. You can easily create a new distribution channel for your business with Greentree’s WebStore system that makes it simple to sell securely on the web. What's more WebStore comes straight out of the box. Greentree will provide your business with Supply Chain and Distribution capabilities that focus on Inventory Management, Sale and Delivery, Purchasing and Electronic Data Interchange (EDI). There is a growing trend amongst smart customers and suppliers to require business partners to trade via an EDI system to increase process efficiencies and remove delays, errors and communication breakdowns. Be best in class! Greentree’s EDI system allows you to meet electronic trading demands with highly flexible and easy-to-use software, managing your trading relationships automatically and transparently. Effectively maintaining customer assets or systems in many or even remote locations, requires careful resource planning and effective IT. Your business performance can be degraded by overlooked requests, missed service calls, late maintenance, unscheduled downtime, cost overruns and potentially unbilled service delivery. Whether your organization is dealing with internal service and equipment maintenance demands, or with providing services that meet customer expectations, you can remove these risks with Greentree’s Service and Asset Management suite. Greentree provides all the tools needed to maximize your provided service levels to internal or external ’customers’ and help to effectively manage the diverse needs of plant and equipment maintenance. The Greentree Service and asset Management suite is a complete ERP solution which means all processes are integrated automatically with your other Greentree business functions such as inventory, purchasing, fixed assets and occupational health and safety. Whether your organization grapples with internal service and equipment maintenance demands or you are a service provider delivering to meet customer expectations, Greentree's Service and Asset Management suite is a must have software solution for your business. 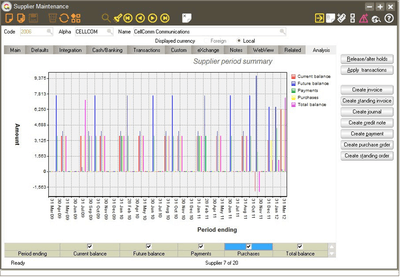 Predicting demand, correctly analyzing material and resource requirements and production planning. Key components of Greentree's manufacturing management capabilities include Bill of Materials, Factory Orders, Material Requirements Planning (MRP), Forecasting and Quality control. Flexible multi-level Bill of Materials (BOM) configurations, visibility and management of costs and processes coupled with the ability to link sales orders to factory orders for priority customers help take the challenge out of managing manufacturing. Greentree will help your business to plan production automatically and accurately while aiding the response to 'on the fly' production planning change requirements. Automatic tracking of quality control and the provision for undertaking unusual testing are benefits that Greentree provides helping to avoid expensive re-testing while saving time and producing increased quality of products. Greentree's eBusiness suite provides a flexible web solution designed to give customers, suppliers and staff the control and instantaneous levels of service and information access they expect. The benefits to Greentree's eBusiness suite are numerous. 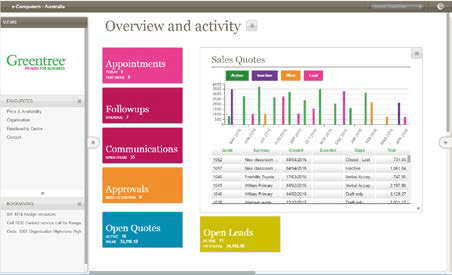 Furnishing your business with full integration with other Greentree modules, the eBusiness suite provides an online stock catalogue, extensive data capture, out of the box functionality, pro-active inventory management, summary statistics and employee and management remote access to name a few. Removing the redundant human elements from the process, in using the eBusiness suite you can expect to dramatically decrease your costs while helping to eradicate mistakes that can damage your business. 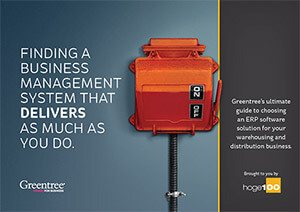 Greentree's eBusiness suite not only empowers your customers to get exactly what they want but suppliers can also streamline your business process by reaching into your systems and monitoring inventory levels, initiating requisitions and dealing with delivery and payment enquiries. Whether you’re in the field or back in the office, Greentree4Timesheets-Mobile enables you to accurately record time against the work you’re doing – in summary or detail. And it is really easy to use; configure fields the way you want them with in-built reminders to ensure your timesheet’s never running late. 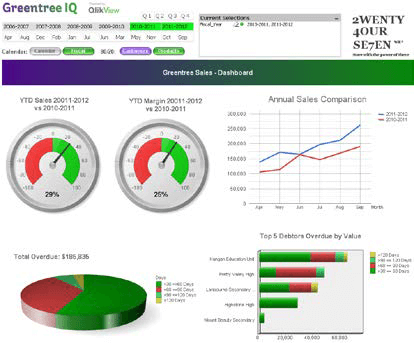 Fire up Greentree IQ to see your business in a whole new light. It's graphical, it works the way your mind works and it's fast and easy to use. In the modern business world there is more data being collected and stored than at any time before. Greentree extracts real business intelligence from it that will provide your business with all the answers. Greentree IQ will illuminate grey areas of your business providing clarity by making sense of the morass of data available. Traditional reporting is slow, rigid and not perceptive, you can avoid seeing things too late with the suite of Greentree IQ solutions. The next generation of interactive Business Intelligence is here! Day-to-day business management decisions require access to the current state of play in your various business divisions. The term 'one size fits all' could not be further from the truth and Greentree know that your business demands detailed information from many varied reference points. In answer to these demands, Greentree has delivered a wide range of tools with an open design to support the reporting, analysis and information enquiry needs of your business. With flexible search filtering, a 360 degree view of information and wide web accessibility, Greentree's reporting tools can help you to drill into your business information from anywhere. Easily exchange information between Greentree and other software applications and devices. Greentree’s API connection engine enables data to flow both ways, enabling all your applications to effectively ‘communicate’ with Greentree. Another of Greentree’s key advantages is F.R.E.E, Greentree's live integration to Microsoft Excel® which affords a wealth of options to business managers in terms of configuration and presentation of financial reports. With Reports and Documents you can manage all your financial reports and documents from the one location. Share the information across your team with built in alerts to tell you how many items are awaiting your attention. Never miss an important report, contract, agenda, update or any other record again. Harnessing these processes to deliver mission critical information to staff at the right time and being able to automate as many of your business processes as possible, is what Greentree does best. 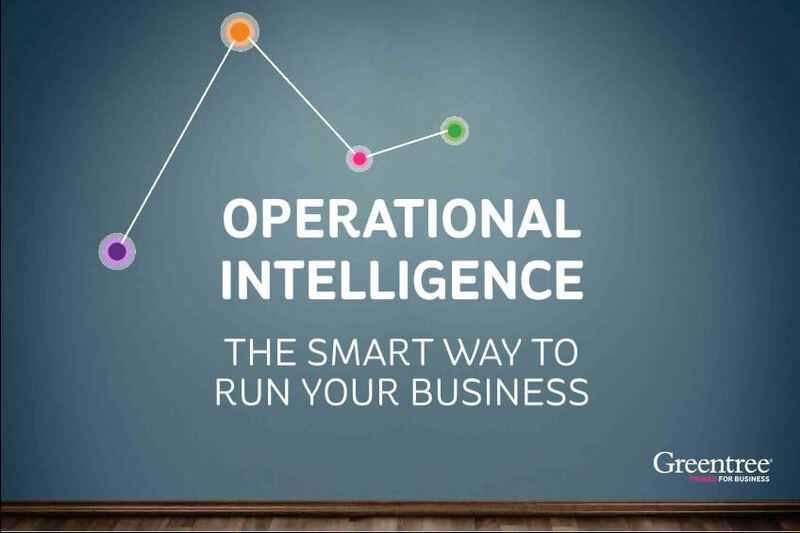 We call it ‘Operational Intelligence’ and it enables you to connect the dots right across the fabric of your business. OI delivers very real Return on Investment to any business and it’s the closest thing to a silver bullet your organisation is going to get. Incorporating advanced work flow management, a group approval system, controlled authorization and 3D live visibility, the profitability of your business if directly affected through the effectiveness of all staff involved. Traditional process management has involved good staff supported by basic printed documentation, Greentree Workflow advances the effectiveness of those 'old ways' in today's rapidly changing world. eDocs slashes the time it takes for you to receive, route, code and approve documents – from invoices to remittances, statements and expenses, you’ll be amazed at what you’ll save. Approvals and Alerts is an approval process-management tool that applies to appropriate users and virtually all Greentree records. System Alerts - Define unlimited rules to trigger alerts from across the Greentree system to automatically notify users of critical information, e.g. when a customer goes over their credit limit. You can design alerts based on scheduled or data driven rules. Approval Management - Have your approvals processes configured to completely suit your business needs, e.g. for a multi-level approval process, including groups, multiple and sequenced or based on events or exceptions. Approvals on the Run - With web or mobile-based interfaces make sure approval processes are not held up while staff are out of the office. Flexible Notification Options - Enable alerts to get through with flexible delivery options including email, pop-up screen notices and SMS. Fraud Prevention - Ensure your business complies with the internationally accepted compliance standard Sarbanes Oxley, as well as other jurisdictional requirements. Maintain compliance by means of approval rules that make fraud difficult and alerts that highlight potential problem areas. Initiate New Business Process - Use Alerts to trigger the start of a new business process e.g. purchasing a fixed asset triggers the creation of a fixed asset in the Fixed Asset Register. 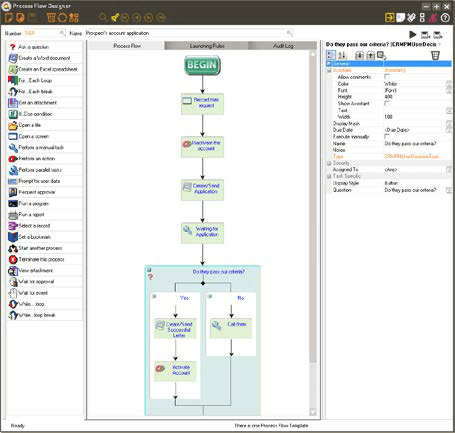 Escalations Engine - Use Escalations to monitor by exception e.g. to identify actions that have not been completed on schedule. As managers and senior staff become increasingly mobile in today's fast-paced world, the need for them to remain hands-on is just as important. eApprovals is the online version of Greentree’s Approvals and Alerts module and gives users the information and tools they need to process approvals in real-time from anywhere, to keep your business moving. Screen Designer does more than any other tool to put the power in your hands. In any of the browser-based Workspaces you can change what’s displayed and edit any panel form. See page 10 for more information.